My worst volunteer experience was when I was assigned to work painting faces at a holiday fair at the school my kids attended. We had "mandatory volunteer hours" and I signed up for an event and was assigned face painting. No one checked to see if that's what I wanted to do or if it was something I had a particular talent for. Now as an association exec, there were likely a dozen things I could have done really well. I never would have selected face painting. Rather than complain or try to change I figured it wouldn't be too hard and it was "only" two hours. Totally, totally stressful. It felt like 2 years. Kids apparently don't just want polka dots on their face or whiskers - but were requesting really complicated things like a Patriots football helmet (with logo) or vines intertwined with flowers and ladybugs. The other mother painting faces excelled in all these artistic requests. I quickly noticed the only ones in my line were the kids with impatient parents (the other line considerably longer than mine) or ones with toddlers too young to notice the difference. One kid even told me that he really wanted "the good mother". 1. It makes sense to ask volunteers what they want to do. List the tasks within the scope of a committee instead of just the entirety of it. 2. Ask what their talents are. Sometimes associations hear "I'll do anything" without checking to see where that volunteer may genuinely excel. Testing in a random role may or may not give positive results. 3. Give an option to stop. If it's fairly clear someone isn't enjoying their role - why not ask if they want to stop rather than assume everyone wants to ride out the length of time they originally committed to? 4. I never volunteered for that event again - in any capacity. Want to turn a volunteer off - give a bad experience. Today's New York Times says this: "the term 'cyberchondria' emerged in 2000 to refer to the practice of leaping to dire conclusions while researching health matters online." Microsoft recently released a survey that "suggests that self-diagnosis by search engine frequently leads Web searchers to conclude the worst about what ails them." Apparently 2% of all searches are health-related; and results are as likely to show something terrible as benign. I think 100% of my searches show something dire. Observing what's happening in the news or around you can provide opportunities to be creative and/or use it to draw attention to your own issues or comments. For example, as candidates continuously brought up change during the election, one church put up signs in the middle of campaign signs: "Jesus is the Answer: Real Change begins with Him." One candidate put up a tiny sign that was noticeable because it was so different from others. Guy Kawasaki wrote how a blog on budget fashion created a candidate wardrobe for under $3K after all the press about the $150K wardrobe. Blogger and association exec David Patt once told me he blogged about the impact of a nationally-reported bridge collapse on a local race (for a running association that's interested in race routes). Things happen all the time with a potential spin, story or angle related to our own industries. Do we try new directions? 6. Portions of his writings on Federalism were considerations in writing the Constitution. Who says one person can't do a whole bunch of things? Should you ask these 2 questions? An interesting detail of President Elect Obama's vetting process is the questions. Here's a few of the 63. Should you ask these questions (or some variation of them) to your own job applicants? The answers might be more interesting than their greatest weakness. Shouldn't I be able to walk my dog without answering email or texting? Well today it was really cold and as we meandered around the neighborhood I was wishing for gloves I saw in Oprah magazine last night. There's little touch technology pads on the index and thumb fingers of the gloves to be able to use some handheld electronic devices without needing to take off the gloves. If the gloves work with Blackberries, my dog Baxter is not going to like this. Or maybe he'll get longer walks. Bemoaning the fact I have a 7 hour wait at an airport, a fellow meeting attendee suggested that I go to the airport spa. As I sit at Northwest terminal waiting (and working), thought I'd Google it. This is how treatment described: "Oxygen Therapy -- You sit in a comfy chair with a two-pronged plastic tube up your nose, usually for 15 minutes, getting oxygen scented with essential oils that help you relax or boost your immune system." The official spa website describes its $18 oxygen treatment this way: "A 15-minute session enhances stamina, eliminates fatigue, minimizes toxic build-up and intensifies mental alterness. " Hmm, that's fixing a lot of things for $18. Chalk it up to my cranky mood, but why do I think I'd end up with someone else's cold if I tried this? However, there's always the manicure option, which won't do anything for my mental alterness but likely where I'm headed. Saw a man at Detroit airport tonight with a desk for his laptop hooked to his carry-on luggage. He was standing and typing. Appeared sturdy enough. Apparently the desk can be adjusted so you can sit and type too. Rather than continuously teaching (or preaching) about new technologies, maybe associations should follow Oprah's lead and just routinely use them. When members use them as part of their association experience they'll realize how they can also incorporate them into their own business. And that's a value associations bring. When you invite a colleague to participate in another state, and he/she donates their time, do you care if they get additional inconveniences? Tonight I got an email related to travel to a Board meeting in another part of the country (I volunteer time - they pay expenses) saying BY THE WAY everyone needs to share transportation from the airport to the hotel. Big detail: We're not on the same flights. What's the message? My time isn't as valuable as the transportation cost to the hotel? I am very aware of how much I give up personally (and professionally) by volunteering to do anything - and I believe our association volunteers are very aware of what they give up when they volunteer too. If we ask for time, let's not waste any of it. So a tanned and athletic Lance Armstrong strolls out on stage in jeans and starts talking. I was struck by how entirely different his messages are from a more typical convention program message. 3. "I made excuses instead of recognizing symptoms." Lance said that headaches and blurred vision must have been after-effect of drinking or stress, coughing blood must be related to a sinus problem, testicular pain must be the bicycle - but they were actually cancer. He urged attendees not to ignore symptoms and not to have changes in their body that are "too embarrassing" to discuss with a doctor. If it's your health, work, personal life - if you're making excuses you might want to look at the symptoms. Here's an interview he did at a conference two days before ours .... if you'd like "more Lance". Employee incentives don't need to be large to bring success. A colleague relayed he offers $25 gift cards to employees for a number of success-based endeavors, such as securing a headquarters hotel reservation for an association officer or staff person attending a state or national conference. He'll give each staff a name of someone traveling to a meeting, and all those who can get the inexpensive rate at the first or second choice hotel for their name gets a gift card. Usually requires they're online at opening date/time (like trying to get concert or sporting event tickets) - but makes it more fun to have an incentive and has increased their success (and overall savings too). 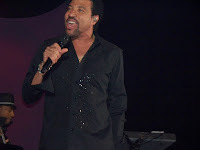 Attending our national association's convention, tonight Lionel Richie was the Celebrity Concert. Thought I was late but turned out it was just as he was coming on stage, and just as they let attendees up near the stage. Like last year (with James Taylor) I ended up very close to the stage. 5. A new concert trend was started: the business card. There were room keys being handed to Lionel, and even committee badges and a rose. But when he said he wanted to buy a house and asked someone for their card, hundreds of hands went up holding business cards - and he collected stacks of them. And this went on the whole concert. All night long. All night. Does anyone really believe that because a name is inserted at the start of a mass email message, or added onto an electronic newsletter, that it's a more personal communication? It's really clear the difference between a sincere personal email and a clear mail merge of a database list into email communications. Occasionally someone is going to make it really obvious they're using technology to try to appear personal (e.g., by using a formal name or complete name) - or they're going to screw it up. I recently got an email from an airline that started "Dear Mr. Soandso" ... then continued. A few hours later I got an email apology saying that a technology glitch caused a problem with the database of their "valued customers" and regret if it caused offense. My first inclination was to feel really sorry for the poor staff person who likely got into trouble for it. The next was wondering why they needed the name in there anyway. Collectively maybe we are Mr. Soandso? When email has MORE information that's part of the personalization -- such as mileage or hotel points -- or the status of an online order -- then including my name adds to the confirmation. But if it's just a mass-solicitation or newsletter, skip trying to add a name to it. If it arrives in my email, shouldn't the assumption be that I know it's for me? And if it's a mass solicitation or an e-newsletter - chances are good I know it wasn't written just for me even if my name is in a salutation. Is that what your members might think too? Consumer Reports magazine (Dec. '08) includes mention of significantly lower cost to send an overnight or 2-day delivery package by US Postal Service (USPS) versus Fed Ex or UPS; and their testing showed the same reliability. When's the last time you checked the current actual costs for various overnight delivery services? Check out the USPS site for more info about their services, including discounts for arranging shipping online. Guess I skipped that course. But where was it? I'm beginning to believe there's a whole set of skills that full-time association executives may not necessary possess (or maybe it's just me), and I wonder how they even learn. My daughter plays a college sport and it seems many parents know how to set up fairly elaborate tailgate events each game. Like BLT sandwiches for 75, or really hot vegetarian chili -- but they can drive it across three states and somehow it's hot at the end of the game -- and set up in minutes too. Where exactly are these "life skills" courses for association execs?